Let’s for once not talk about art and artists in this letter. Why should we? Although come to think of it, it will inevitably be about that. Because this letter will appear in the context of the Sandberg Instituut and the Master of Fine Arts, Reinventing Daily Life. An artistic context. Which automatically puts it within a discourse on the role of art. But still, let’s ignore that discourse for once and speak to one another as living creature to living creature. As one human being to another. What can human beings do in the 21st century? What may they hope for? What can they know? (What should they know? What do they want to know?) And, perhaps the most important Kantian question of 2018/2019: what ought they to do? I did not build the buildings that stand in our city, nor did I found the companies that occupy them. Nor did I decide that there should be a MacDonald’s on practically every corner in this world. I think there are too many people, but I’ve never been in a position to turn off the human tap. I really don’t need plastic bags, and as far as I’m concerned it wasn’t necessary for human beings to have ever started eating meat. I think that the role of the banks in this society could have been defined differently, and I’ve always been taught that if you steal something you have to give it back. Anyway, I was born and so ever since I have been a part of it all and jointly responsible for it. I’m part of Team Humanity and that’s just how it is. A pretty big team, I have to say. And I don’t have a permanent spot on it. Or: I sit in the stadium’s sky lounge. Depends how you look at it. OK, I’ll leave this metaphor for what it is. Can an image or a building or a bank or a park ever be non-political, non-ideological or non-ethical? Doesn’t everything we see imply a view of how life should be? And when we’re born aren’t we automatically embedded in the most dominant system of the moment? So, if you want to change the world (daily life) wouldn’t you do better to start with that system and go into politics? Or are the arts also capable of changing the world at a systemic level? Surely that’s always been the domain of politics? Why is it then that you and I choose the arts and not politics? (All right, we’ve ended up in the arts and artistic practice.) Or do you actually choose politics in your head? Or is every work of art always political? Politics or art, the question from a human perspective remains the same: where do you start mopping up? Especially with the proverbial tap turned on 24/7. Or is this what you call a typical 21st century millennial problem? A growing consciousness of nearly all local, national and geo-political evils in combination with the megalomaniac idea that you, an individual, should and can do something to change all those things. We could all equally well be Nelson Mandela. Why not?! Yes, we can! After all, Nelson Mandela wasn’t born as Nelson Mandela, was he? He became that by working hard and chasing his dream. So, what can we do? Where shall we start? Sometimes I think that I’m dreaming my life and that this dream will automatically play out as it wants to play out. That my life is passing before me like a Truman Show, without my ever knowing who in fact has been looking at me all this time. But when, on a certain day, I think that this is an overly passive and easy attitude on my part, I sometimes think that I could change that daily life. That we should be able to offer alternatives. That the buildings standing there and what they imply could equally well be other buildings that convey something completely different. That a postman could equally well perform his work according to a playfully designed choreography. That a shopping street full of empty shops is a good addition to what’s currently on offer. That a bakery could just as well be an opera house. Perhaps what I have just described has always been the domain of art: alienating, offering an alternative reality, mirroring misconceptions in current systems and accompanying behavior. But at the same time, in the context of a theater or a museum, it can always be safely packed away in a box and tied with a ribbon. This is art, this is allowed to unsettle you. Just a little. Not too much. Only 10 euros admission. You can’t go wrong with that. What would happen if the functions that have traditionally belonged to the domain of the arts were no longer assigned exclusively to the arts, but treated as something that we expect of everybody in society? A collectively borne responsibility for creating an inspiring, inclusive, honest, imaginative society. Based on the idea, or rather the confident belief, that everyone is in fact capable of making a contribution based on their own expertise. There must surely be more people who are dissatisfied with the decor of the dismal dream that plays out every day in front of our eyes. In that scenario the artist is no longer one of the chosen few. No longer the romantic, unconventional, autonomous ideal of times gone by. She is no different from the doctor or the fire fighter and knows her place in the whole. The artist senses what is needed at a certain moment and tries to give shape to that by connecting places and people. Which raises the question: does the current age need artists (in the traditional sense of the word) or simply people with a functioning moral compass and a capacity to connect? People who simply feel what’s needed and proceed to look for an appropriate form? Art doesn’t necessarily have to change the world, of course. Even if that were possible. Art may do whatever it likes and an artist is free. But can anyone, from a human perspective, really afford to absolve themselves from the moral responsibility that all human beings bear? Or am I getting carried away by my Calvinism? Were we born with this obligation? Something from which previous generations tried so gratifyingly to free us. We could know everything if we wanted to. And doing something is often merely a question of starting. Is there really still something for which we may dare to hope? 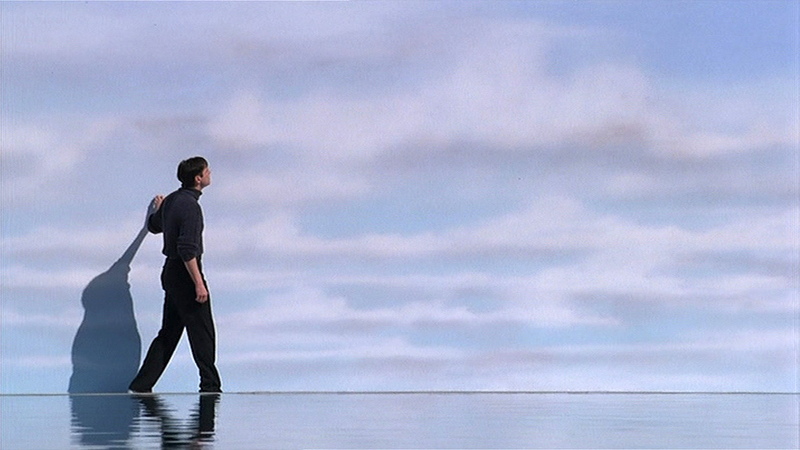 The Truman Show (1998), Peter Weir. Thomas Spijkerman is founder and artistic director of the contemporary music theatre company Circus Treurdier. He and the group make theatre and television productions, and tour the country performing their work. Circus Treurdier aspires to create a fusion of high and popular art and position important social issues in alternative theatrical settings at varying locations. In 2016, he was appointed artistic director of Reinventing Daily Life, a Temporary Master programme at the Sandberg Instituut. Spijkerman also teaches at the School for Drama & Contemporary Music Theatre in Amsterdam.